Cameron’s first season of high school golf is quickly coming to an end, just as the last rays of summer sunshine are fading. 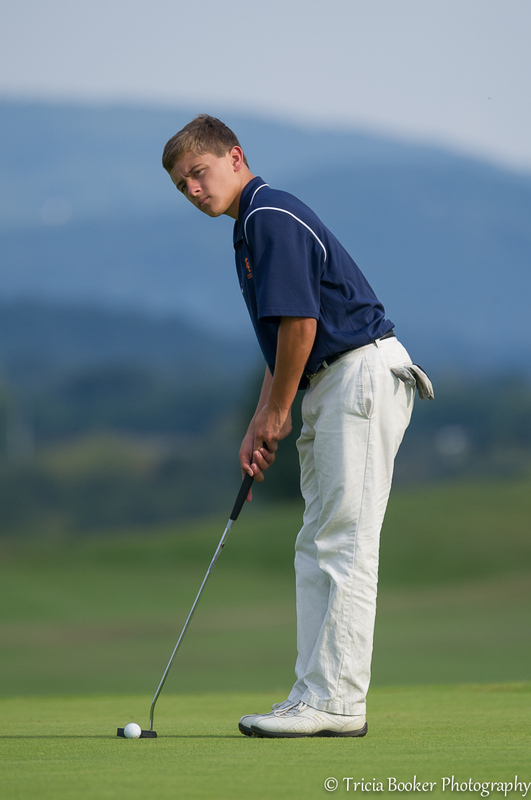 He’s played in a variety of tournaments and nine matches for Clarke County High School since the beginning of August, with the highs and lows all golfers seem to experience when the pressure of competition comes into play. While there were certainly moments of frustration for Cam when he didn’t score as well as he’d hoped, I observed more drive and optimism in the aftermath instead of disappointment. His game has matured a lot since the season started, with help from Coach Scott Tredway, his teammates and also his opponents. I’ve attended several tournaments and matches and been fortunate to spend some time walking the links photographing the players and chatting with the coaches. Not surprisingly, I was impressed with the dedication everyone has to the game, but what I didn’t expect was the atmosphere of fun and camaraderie. Players and coaches alike root for their opponents, they give high-fives for great shots, help search for lost balls and share snacks and tees. When one Strasburg player made the first eagle of his career on the final hole last night, he had everyone from all four schools cheering and sharing in the excitement. Yes, scores come into play because, after all, this is a competition. Bragging rights and newspaper articles are at stake, but it’s not what’s really important. After my initial observations this season, I see high school golf more about competing against the course and playing with friends and not against them. And I’m glad Cam has found his niche here with these great kids and coaches. What a great tribute to the game, the school program, and the coaches. Anything that gives young adults a chance to improve their performance mainly gauging their success against themselves while having fun makes perfect sense to me, even though seeing the game played on TV seems soooo slooow. . .and hushed. What you describe seems so much more fun. I have to say, I enjoy the movie from 2000, The Legend of Beggar Vance. I know there are critical issues raised about the film, but I liked it! Gave me a glimpse into the inner game of golf. Thanks, Patti! The game is a bit slow at times, that’s certainly true. It’s funny, though, when you’re out walking with the players it goes by more quickly. Looking for errant shots also takes some time 🙂 But all in all it was a pleasant surprise to experience the sport from this side. Thanks for mentioning that movie, too. I don’t think Cam has seen it, so I’ll make a point to look for it the next time we’re renting a movie. When the kids can enjoy themselves and root for each other, that’s the best in sportsmanship. And, it lets them to enjoy and appreciate the game more fully. I’m glad your Cam has had a good time playing. Thanks, David! It’s more fun than I expected. I guess watching golf on TV seems so serious. While there are players that take the game more intensely than others, it’s generally a relaxed atmosphere. I think golf is also a bit like horses in that the players are always striving for that perfect shot (or distance to a fence), but so many things can go wrong on the way to getting there. Cameron will be very happy with these delightful images. So much joy and positive energy you have captured! Am I seeing the next Tiger Woods?…………..